I hate old 3D. Granted, not all of it, just the lame cartoony variety that attempts to mimic animated art but ends up looking crude and primitive. 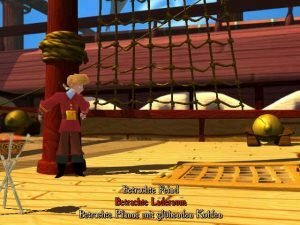 Even with the benefit of talented artistry, Escape from Monkey Island can’t measure up visually to its older, hand-drawn predecessors. If you can get past that gripe, however, you’ll find a worthy successor to the series. 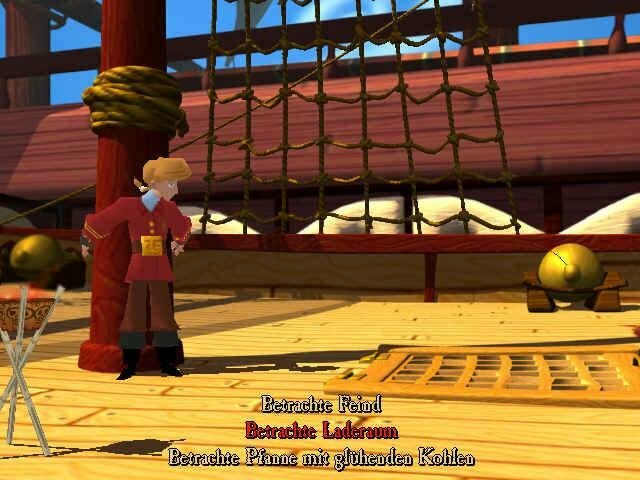 Escape From Monkey Island is the fourth game in the Monkey Island series. 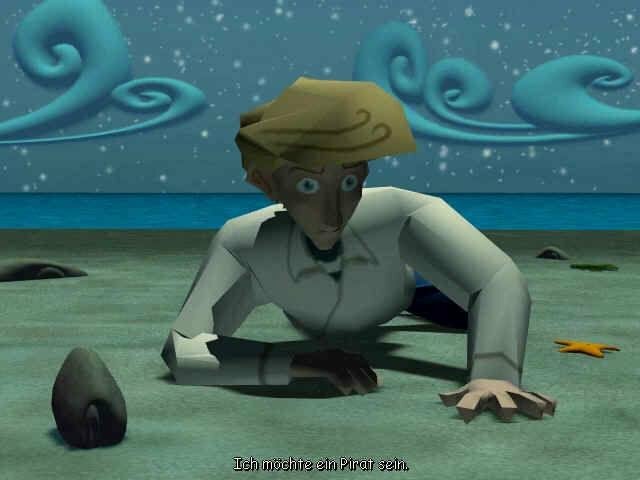 You play as Guybrush Threepwood, a shrimp of a pirate with a good heart. 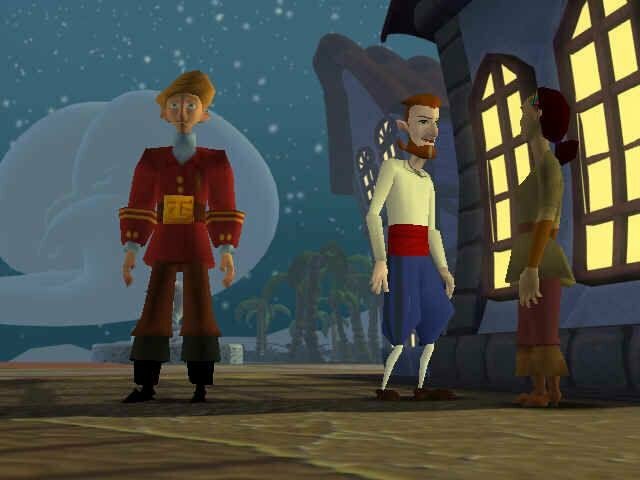 Guybrush started off as a youthful pirate-wannabe in the original Monkey Island, found treasure, saved a damsel, and defeated an evil zombie pirate. 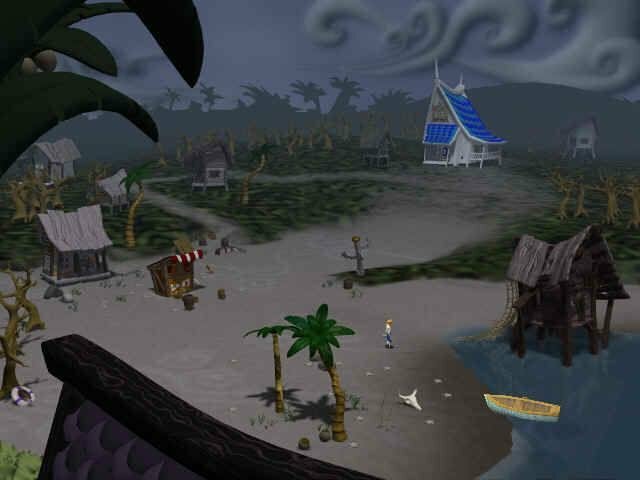 Escape From Monkey Island starts off just as Guybrush and Elaine Marley-Threepwood return to Melee Island from their honeymoon. It appears that some evil powers have been at work during their absence — evil Australian powers. 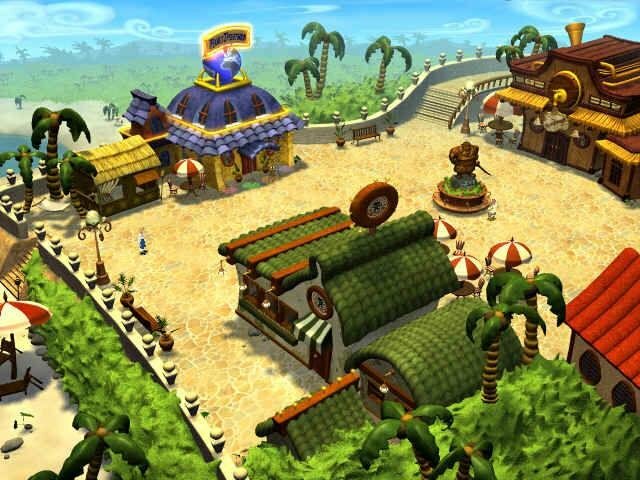 A wealthy businessman named Ozzie Mandrill has been buying up land all over the Caribbean and setting up re-education centers to turn dangerous, blood-thirsty pirates into harmless, productive members of society. Even pirates who don’t want to sell their establishments have to give in to Ozzie eventually because he challenges them to a duel of insult-swordfighting and never loses. At the same time, a stuffy new politician named Charles L. Charles is trying to take over Elaine’s position as Governor of Melee Island by having her declared dead. 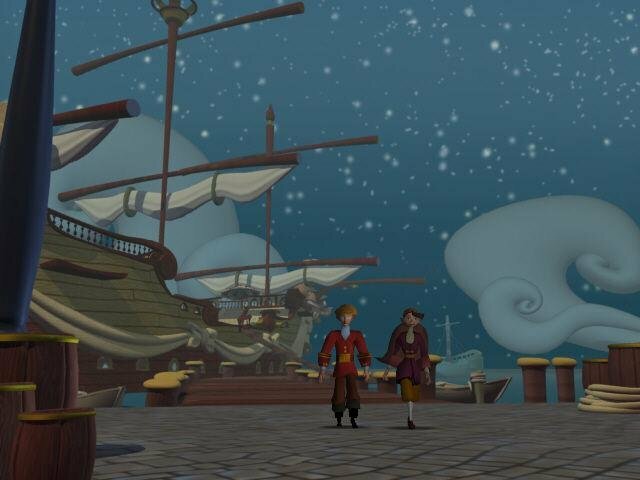 Guybrush and Elaine set out to get things straight. 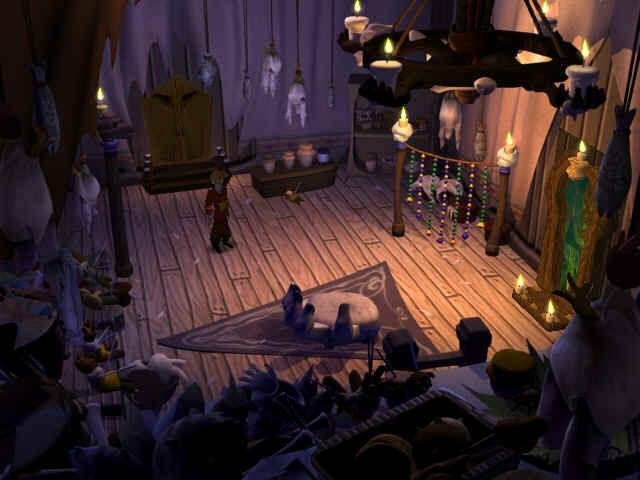 While Elaine goes off to campaign against Charles L. Charles, Guybrush has to clear up Elaine’s death declaration. 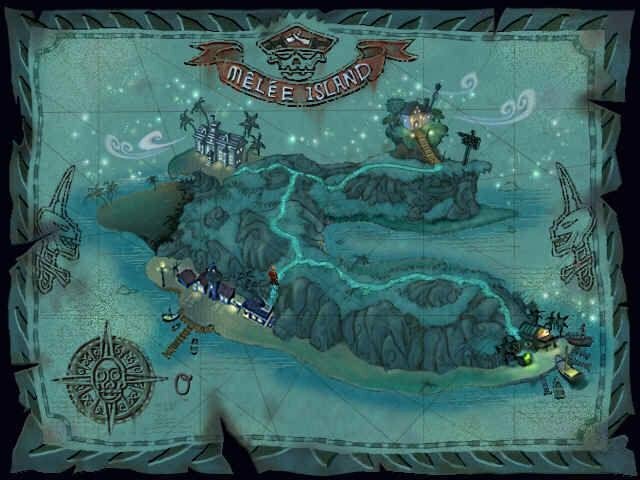 To do that, he has to travel to Lucre Island to meet with the family lawyers, which means assembling a crew and finding a ship. 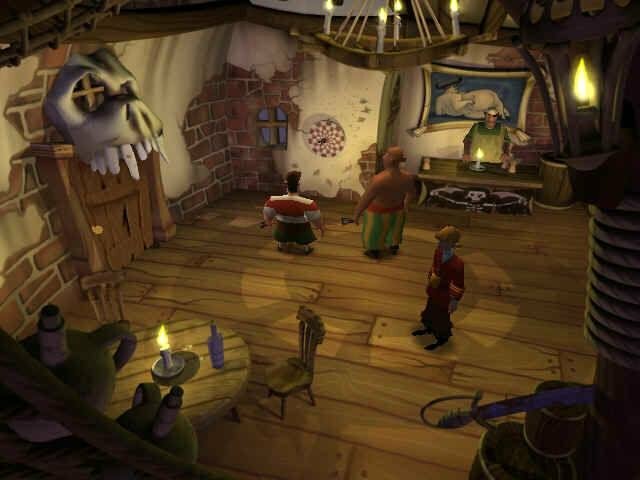 As fate would have it, things are never as simple as they should be, and Guybrush soon finds himself in the midst of a huge conspiracy involving pirates, monkeys, no-nosed bank robbers, the Church of LeChuck, and LeChuck himself. Eventually, he’ll have to uncover the secret of the “Ultimate Insult,” an insult so devastating that it will turn even the most hardened pirate into a quivering, pathetic, soulless mess. 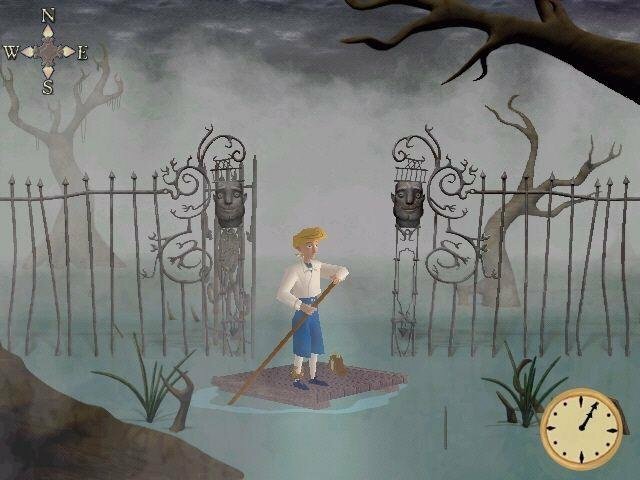 Yes, folks, it all rings of good ‘ol Monkey Island-style/Monty Python-inspired gaming goodness. While the LucasArts team stuck with the general look and feel of the series, there is one great fault to this iteration – it’s just not quite as funny. 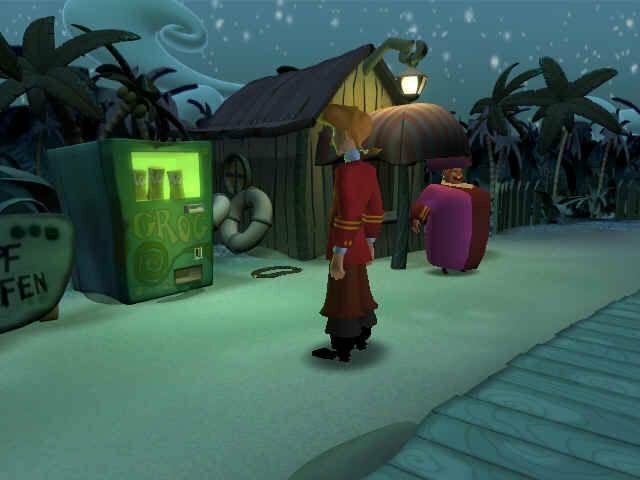 I’m not saying that the game isn’t funny at all — there are some truly brilliant gags (such as the visit to Starbuccaneers), but that certain something, that hallmark of classic status is missing. 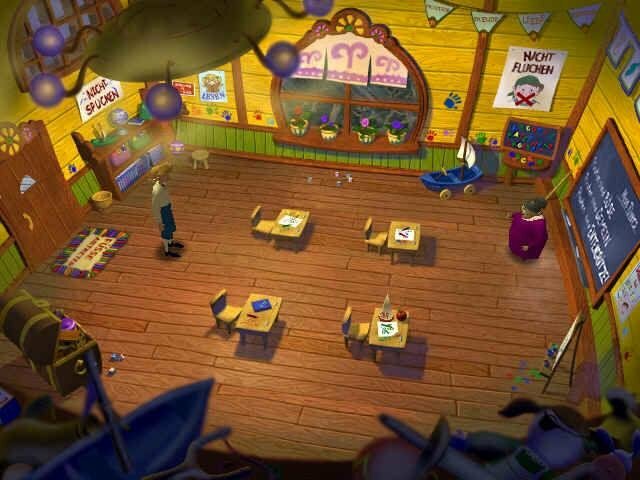 Many of the series’ characters are back, including the Voodoo Lady, Stan the Salesman, Herman Toothrot, your original crew from the first game, and even Murray, the evil talking skull. 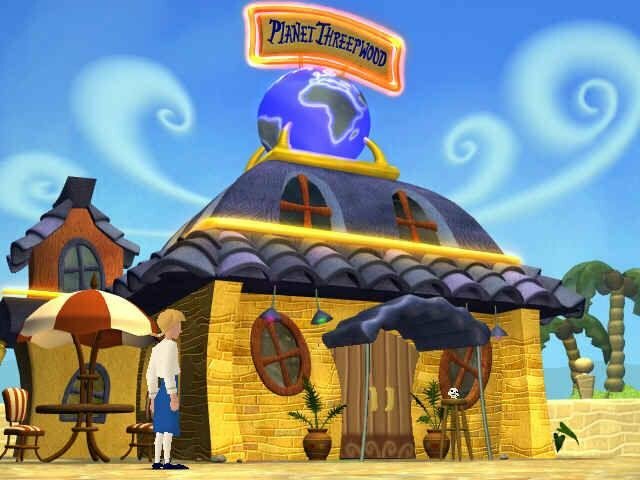 You’ll also get to revisit some classic locations from the previous games. There are definitely high points, but you’ll also come across some quirky game design. My biggest gripe is with the Monkey Kombat portion. So what is it? 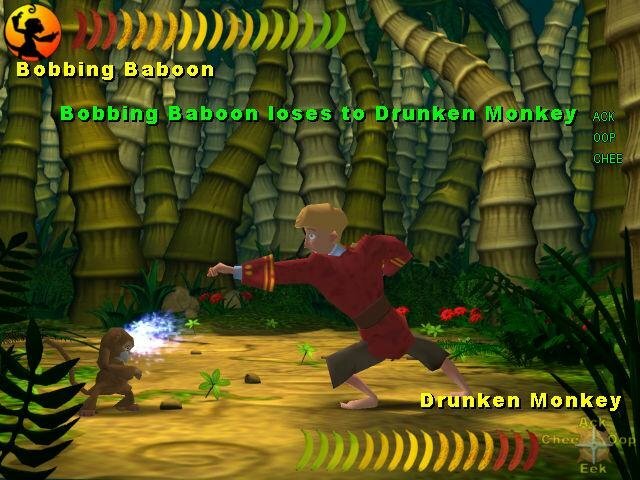 It’s the most basic form of combat and consists of five stances – each stance defeats two other stances, and each stance is accompanied by a monkey insult. These insults are made up of combinations of four monkey words: Ooop, Eek, Ack, and Chee. Each combination lets you transition from one stance to another. You can transition from the Drunken Monkey stance to, say, the Anxious Ape stance. Bored yet? How do you find out which stances beat what? You’ll have to pick fights with other monkeys and lose, all while taking notes of which combinations make which transitions, and which stances are stronger than others. In all, it took me an entire night of tedious note-taking before I mastered Monkey Kombat. Initially, it’s a blast to watch Monkey Kombat. 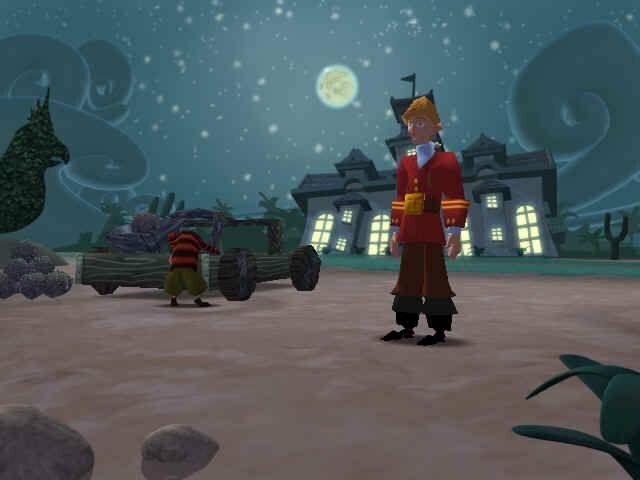 Few things are more hilarious than seeing Guybrush square off with a monkey half his size. They’ll pull off classic Street Fighter moves, hurl fireballs at each other, and even pull off a few crane kicks. Then the realization of what you need to do settles in, and it’s not that fun. 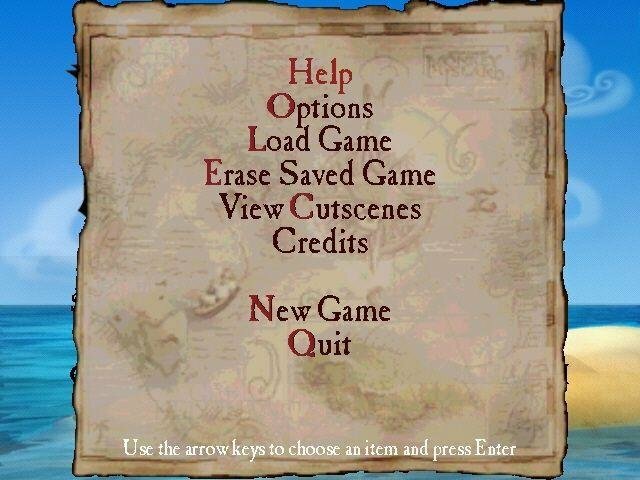 Still, despite some annoyingly busywork puzzles, Escape From Monkey Island is a nice game. It’s fun, funny (if not at the level of the earlier games), and full of memorable, likable characters. The majority of the puzzles are passable, the story moves along at a good clip, and you always have something to do.